The “people’s climate march” was notable for the amazing energy, economic and climate illiteracy displayed by the mostly young people parading along New York City streets September 21. Their chants, rants and placards demanded that we stop climate change (that’s been ongoing throughout Earth and human history), eliminate fossil fuels (that supply 80% of the energy that makes their modern living standards possible), ban fracking (which is largely responsible for reducing the carbon dioxide emissions they blame for global warming that ended at least 18 years ago), and abolish capitalism! * Al Gore grinning for a photo op with NYC Mayor Bill DiBlasio and UN Secretary General Ban-Ki Moon. This is same Al Gore who got a C and D in his two college science courses, told “Tonight Show” audiences that the Earth’s interior is “several million degrees” (the core is actually nine thousand deg F), and refuses to debate anyone on climate change or even take audience questions he has not preapproved. * Actor Leonardo DiCaprio basking in the NYC limelight, releasing a series of movies claiming that climate change is immediate and dangerous, and marching with other people’s anti-tar sands and “100% for the planet” signs – after arriving in the Big Apple not via commercial jetliner and subway. Wow! I wasn’t aware that asking inconvenient questions or pointing out inconvenient truths was improper – especially when posed to people who put themselves forward as paragons of virtue for leading campaigns that inevitably restrict access to energy, lower developed country living standards, and keep the Third World impoverished – while the leaders enjoy lifestyles that are many times more profligate, carbon-intensive and carbon dioxide-spewing than the average American or African citizen’s. “I think they should be in jail … with all the other war criminals.” Republican politicians too – “those guys are doing the Koch brothers bidding and are against all the evidence, saying global warming does not exist. They are contemptible human beings,” he fumed. So RFK the younger wants to punish us for the “crimes” of exercising our First Amendment rights, demanding actual evidence to support alarmist assertions, saying people’s needs for reliable, affordable energy must be part of the conversation – and insisting that those needs take precedence over absurd claims that climate change is “the world’s most fearsome weapon of mass destruction,” posing “greater long-term consequences” than ISIL, terrorism or Ebola, as Secretary of State John Kerry insists. Mr. Kennedy needs to read the Constitution, reflect on the once proud history of free speech and civil rights in the United States, and acknowledge the harm his policies are causing. He also needs to get his facts straight. None of us says global warming or climate change “does not exist.” Global warming, global cooling, “climate disruption” and “wild weather” have been “real” since Earth began. What we challenge is alarmist assertions that human carbon dioxide emissions have replaced the powerful, complex natural forces that caused repeated ice ages, little ice ages, warm periods, droughts, storms and other fluctuations throughout history. We dispute claims that any climate changes will be dangerous, and are our fault. We vigorously refute claims that CO2 is “pollution.” This is what we exhale. It’s the trace gas (0.04% of our atmosphere) that enables plants to grow, and makes all life on Earth possible. We debunk talk of countless “disasters” that Climate Armageddonites – from President Obama on down – blame on fossil fuels and insist “are happening right now.” The planet hasn’t warmed for 18 years. The nearly nine years since Wilma in October 2005 is the longest period since 1900 (and maybe the US Civil War) without a category 3-5 hurricane hitting the United States. Floods, droughts and other events are all within historic patterns, as readers can see in my new report, Climate Hype Exposed – how pseudo-science is used to justify policies that hurt jobs, liberties and people. 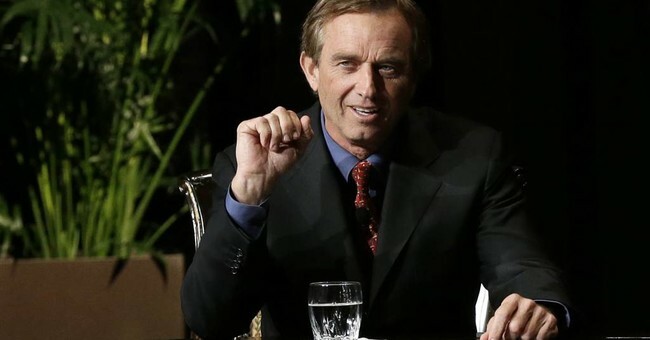 Just as crazy, RFK Jr. made it clear that he and his wife will not give up their $5,000,000 Malibu home or “reduce the, uh, our quality of life in order to have a, uh, rational free market, in order to, um, stop the use of carbon and to divorce ourselves from a fuel that is destroying our planet.” But they, many of the NYC marchers and climate alarm leaders are surely doing all they can to reduce your quality of life. The policies RFK & Comrades demand would raise the price of fossil fuel energy that powers our modern world, creates and preserves jobs, and improves, enhances and safeguards lives. In Europe, they’ve made energy so expensive that millions of pensioners and other poor families cannot afford to heat their homes properly – and thousands die needlessly from hypothermia every winter. We’re heading there, too. They cause millions of deaths every year in developing countries – by preventing construction of state-of-the-art coal and gas-fired power plants, and depriving people of reliable, affordable energy. More than 2.5 billion people worldwide must still use wood, charcoal, coal and dung in open fires to heat and cook; well over a billion still do not have electricity, still do not enjoy its wondrous blessings. As a result, millions die every year from lung diseases due to constantly breathing polluted smoke from cooking and heating fires, from intestinal diseases caused by spoiled food and tainted water, and from countless other diseases of energy deprivation and poverty. The vast majority are women and children. My colleagues and I would gladly go on trial and even serve time for “treasonous” speech against the climate alarm establishment … and for “polluting” the atmosphere with plant-fertilizing, life-giving CO2. But then we would insist that Mr. Kennedy and his comrades also be tried and sentenced: for eco-manslaughter and crimes against humanity, for the disease and death their policies cause and perpetuate. The International Criminal Court might be the proper venue, just as RFK suggested for us. But perhaps the climate demagogues and anti-fossil fuel zealots should be tried – and serve their sentences – in countries that have suffered the most at their hands, for their war on women, children and the poor. Conditions in those Third World prisons are notoriously worse than in the zealots’ mansions, and in the comparatively posh modern jails and prisons found in most of the USA and Europe. Alternatively, these true climate criminals could be sentenced to do community service, while living like the natives: in mud huts, breathing their air, drinking their water, being bitten by disease-infested insects, and having to walk miles to basic medical services when they inevitably contract malaria, pneumonia or dysentery. That could make alternative community service a death sentence – akin to what Mr. Kennedy and his self-righteous friends are imposing on so many unfortunate people. It’s time to refocus. The world needs abundant, reliable, affordable energy, to create opportunity and prosperity, improve and save lives, and enable us to adapt to whatever climate changes might come. Misguided noise about climate change “deniers” and humans replacing natural forces in controlling Earth’s climate serve only to distract us from the critical job at hand.